ASRLMS, Assam Recruitment 2017- State Project Manager, Project Manager & Accounts Assistant: Last Date 31-05-2017. - Jobs4NE : Jobs in Assam and North East India. ASRLMS, Assam Recruitment 2017- State Project Manager, Project Manager & Accounts Assistant: Last Date 31-05-2017. 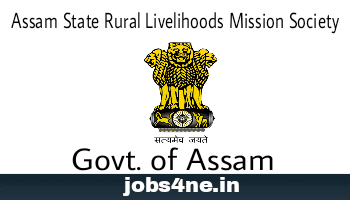 Applications are invited by Assam State Rural Livelihoods Mission Society (ASRLMS) for the recruitment of 04 nos post of State Project Manager, Project Manager & Accounts Assistant. Last Date for Submission of Application: 31-05-2017. Total no of posts: 04 Nos. 1. State Project Manager: 01 No. Scale of pay: Rs. 63000/- pm. 2. Project Manager: 01 No. Scale of pay: Rs. 49000/- pm. 3. Accounts Assistant: 02 Nos. Scale of pay: Rs. 21560/- pm. 1. State Project Manager: Post Graduate degree. 2. Project Manager: MCA/ M.Sc IT or BE-Computer Science/ B.Tech Computer Science. 3. Accounts Assistant: Post Graduate degree in Commerce with knowledge in computer application and tally. 1. State Project Manager: 32 to 45 years. 2. Project Manager: 30 to 40 years. 3. Accounts Assistant: 23 to 40 years. Selection Process: Selection will be based on written test, Trade test and Computer Proficiency test. How to Apply: Interested candidates may apply in Prescribed fromat along with self attested copies all relevant testimonials & Passport Size photo send to the State Mission Director, Assam State Rural Livelihoods Mission Society, Siva Nath Gogoi path, Nabajyoti Nagar, Panjabari Road, Guwahati-781037 on or before last date.